The Allianz Dublin Spring Series in Croke Park kicked (and pucked) into action last night, with a double win for Dublin over both the Hurling and Football All-Ireland Champions - Tipperary and Cork respectively. The series is excellent value, €148 for three tickets to four weekends of football and hurling - this works out at about €12 per ticket (and mine are on the half-way line too). Good thinking by the GAA to get the crowds to matches (35,000 last night). 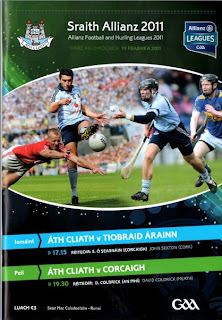 The first match last night saw Dublin beat Tipperary in hurling by 1-16 to 1-15. The game was full of errors and scraps for the ball - a fog added a weird feeling to the game with the ball going out of sight when hit high. The only real excitement was the closeness of the game. Dublin just about deserved to win in my view. All the time I expected the All-Ireland Champions to flick a switch and turn on the style and scores - but they were found wanting against a resolute Dublin side. In the interval between the two games we were "treated" to entertainment by Jedward - I wanted to vomit when I heard this. However, I will have to say that they are excellent entertainers who certainly got the younger crowd going. They were like so lip-syncing! While their act was entertaining, I cannot say much for the song about lip-stick that they will represent Ireland with for in the Eurovision Song contest. 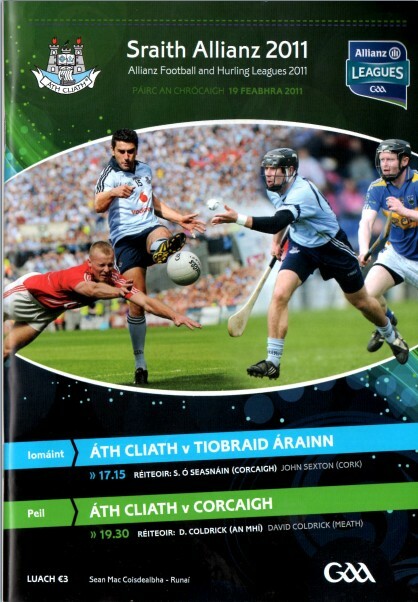 After the Jedward break came the main event - Dublin vs Cork. By now the fog had lifted and we were treated to a very entertaining game. Goals were the deciding factor - Dublin got three while Cork never looked like scoring a goal. In the end Dublin were well worth their victory, but there were many errors by both sides which will mean lots of work for the coaches before the business end of the season. Full marks to the GAA for a great evening of sport. Dublin vs Kerry next week!